The term meadow refers to a type of perennial forage crop mown at least once a year, which may comprise one species - and is called a pure meadow, or a mix of generally graminaceous and leguminous plants - and is called a mixed meadow. If pasture is maintained for more than 4/5 years, it is permanent; if it is maintained for less time, it is rotation pasture. Soil type has a considerable impact on the choice of leguminous plant, particularly as regards pH, calcium content and water stagnation. Fewer soil constraints apply to graminaceous plants, as they are more affected by climate factors. In "difficult" soil/agronomic conditions (shaly soil which is hard to prepare, soil subject to water stagnation, etc. ), Festuca arundinacea should preferably be used, or as a second choice, Dactylis glomerata (Cocksfoot). Rotation mix meadows are perennial crops, the duration of which depends on the plant composition. Their inclusion in rotation is beneficial in agronomic terms, increasing organic matter, improving soil structure and structural stability, and above all extending the time between two alfalfa crops for farms that need to use most of their area for forage. 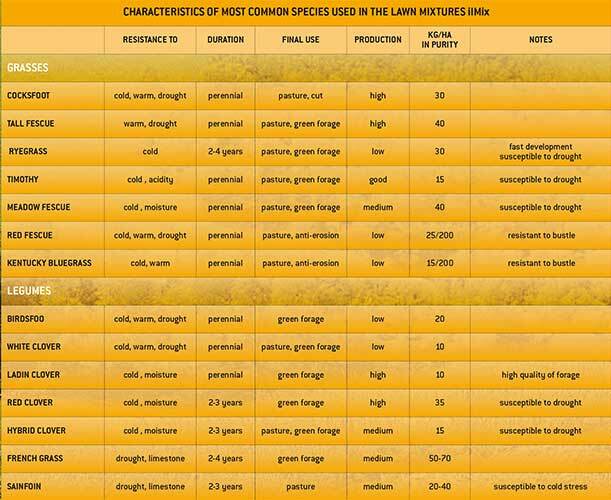 In practice, there are no constraints or preferences for crop sequence choice. Growing in sequence will benefit the flow of nutrients originating from the breaking up of the meadow, so a nitrogen hungry crop is preferable. A root crop is not recommended due to the intense activity of soil fauna typical when the soil is not cultivated. Main preparation involves ploughing down to no more than 30 cm, or where possible, double layer preparation (subsoiling to 40 - 50 cm followed by surface ploughing). In light soil, preparation should be limited, with only surface ploughing. Main preparation should be carried out during summer or the autumn prior to meadow establishment; secondary preparation should be carried out in the period immediately prior to sowing first in heavy, then in loose soil, taking particular care to level out the soil to avoid water stagnation. As even small size seeds will be sown, the seedbed must be thin, without too much soil with a high silt content, where the risk of a surface crust forming is greater. Sowing time Late winter or late summer Sowing technique Pack down before sowing to make the sowing depth uniform and afterwards, to help the seed come into contact with the soil, using cultipackers, particularly in soil where surface crusts form more easily. Take care to keep the seed mixed in the hopper, during sowing. Do not exceed a depth of 1 - 1.5 cm. For resowing without any preparation, special sowers need to be used, that can operate on hard soil. To correctly quantify nutrient amounts, a simple in/out record should be compiled, taking account of crop use in relation to average yield. In general, an excess of nitrogen in relation to phosphorous and potassium will create an environment selectively favourable to graminaceous plants, while a lack of nitrogen associated with a greater availability of phosphorous will benefit leguminous plants. Organic amenders Manure: the main function of distribution during meadow establishment is to improve soil habitability conditions and the soil's ability to slowly release the elements it contains. In permanent meadows, this is the only time fertilizers are administered, and can be used to restore flora and yield, to prevent degradation. The nitrogen dose to distribute during production years is calculated using the simplified in/out method related to yields obtained. Some aspects also need to be considered. The presence of both graminaceous and leguminous plants makes it hard and complex to calculate the dose of nitrogen to distribute, as an excess leads to a rebalancing of the meadow's botanical composition in favour of graminaceous plants. The presence of leguminous plants, i.e. nitrogen-fixing plants, also prevents the exact determination of the fertiliser dose, based on amounts used, as a more or less significant amount is obtained directly from the atmosphere. In dry conditions, where 2 - 3 cuttings take place, distribution should be in two equal doses, one at the end of winter and the other after first cutting. Mowing time is important for the quality and quantity of forage. A delay in using forage will maximise the production of dry matter but drastically decrease quality: fibrous parts increase and the stems gradually lignify and protein content thus decreases. Forage harvesting must be managed to achieve the best balance between yield and forage quality, and in general this value is obtained close to when the plant flowers. The difference in the earliness of species and varieties of graminaceous plants is often considerable (more than 60 days), but less accentuated in leguminous plants. In practice, the growth stage of graminaceous plants is considered to determine optimal periods for use. Palatability and digestibility are directly related to the growth stage when forage is used. A lack of palatability limits consumption by animals and lowers the yield of forage in meat and milk. - increase the palatability of forage. In ilMix meadows, graminaceous and leguminous plants are in optimal proportions and all formulas guarantee the best results for specific uses. Precise knowledge of the plant's growth during the year, behaviour in winter, spring regrowth, resistance to the summer months and autumn recovery, gives farmers the chance to prepare a programme and suggests the time and methods for applying growing techniques that are essential for maintaining ilMix meadow yield in the long term.